Fit-Ink: Boot Camp Day 2: Are We Done Yet? Sumo squats? Back rows? Spider push-ups? Walking backward with a resistance band wrapped around my ankles? I can do these--I've seen them, and done them, plenty of times in yoga sculpt, with the exception of the resistance band which got a lot of use in physical therapy. But it's another story when the familiar is paired with the unfamiliar or the unfavorable, and you never feel like you catch a breathing break unless it's the minute water stop at the halfway mark of the four circuit rotations. I don't like jumping. I decided during today's BootCamp. No more tripping over the jump rope, no more leaping across the room, no more begging for the time to be up, please. I survived round one of yesterday's skater jumps--bounding from cone to cone using the outer leg and hips to really reach--but after that I was starting to hate them and my non-stretchy hips. If you've ever seen me try to get into frog pose, you'll see what I mean: my hips scream in pain the lower they have to go. If I wanted a quick boost to the heart rate, I found it in today's wide leg jumps, loading in the legs to leap to a cone then reload and leap to the next one. But over and over again my body said, "no, thank you," as the sweat started pouring and all form went out the window. I can't even elaborate on the jump rope. I lose my rhythm in one swift swoop, trip over the darn thing and can't start again so I'm forced into kicking my knees high to my hips and those are even more dreadful on this girl's body. Then I really want to rotate to the next station, but the minute drones on...and on...and on. And I don't trust myself on rounded exercise equipment. Mentally I'm telling myself I'm going to fall over, collapse, hurt myself, you name it, the minute I step on top of the Bosu ball or have to use my legs with the stability ball. Putting your hands on the ground and your legs up on the stability ball is hard enough balance wise, and it gets worse when you're supposed to be working your lower abs to pull your legs in and stand upside down in a pike-like position. Trust me, there will be bruises. As for the Bosu, it's the high knees coming back to haunt me. But that's another sweat session in the books...a super sweaty one too. I was already sore going in, but now the unable-to-move feeling has stuck with me all day. And I unfortunately haven't done anything to help it like a CoreRestore class or a Hot Power Fusion, anything to help stretch out those sore spots. Tomorrow, I tell ya. 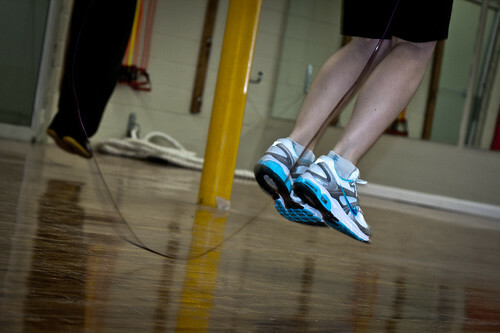 Photo grabbed from andrewmalone at flickr, featuring my nemesis, the jump rope.